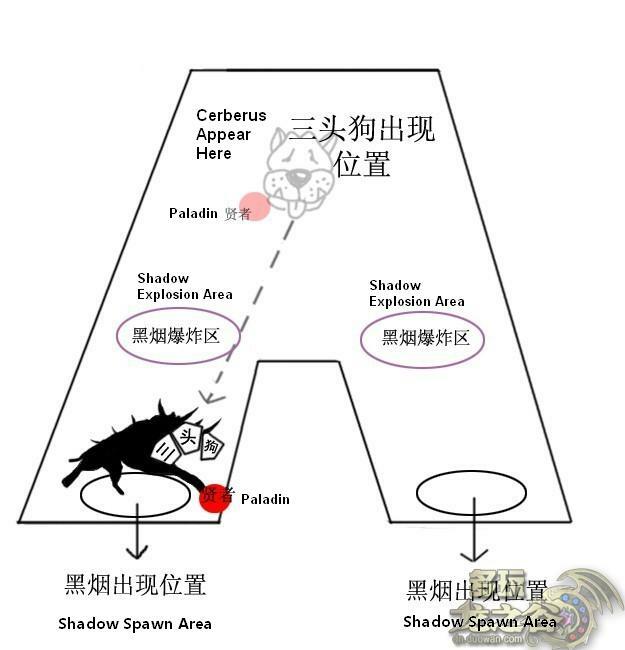 The safest and fastest way to pass this stage, is to drag the cerberus to one of the lane. 2: Spinning attack. After a roar annimation, he will make a spin and deal damage to its surrounding. The shadows are not immune to all sort of abnormal status (timestop, bind, slow, etc). The superarmor also can be broken. * Line up all your relics properly to form a wall to separate the party members from the cerberus. It will block the energy ball from his jump and also prevent him from walking towards the dpser if the paladin lose the aggro. The 3 bosses here are 3 lizard brothers: Crow (Lightning), Toast (Ice) , Tay (Steel). The HP and defence of the 3 lizards are randomly decided. One of them is very weak, one of them is medium while the last one is very strong. The trick here is, the 3 lizards must be killed within 10sec interval. How to differentiate which is the strongest one? Normally large AOE skills (miracle hand and other large AOE ultimate for example) can be casted when the battle just started and the HP reduction for each lizards can be observed. The weakest one should be almost dead or dead very soon. The strongest one probably will still be at HP x4 and the remaining one likely with his HP reduced to HPx3. All 3 lizards are able to dig into the ground and randomly reappear again. To avoid the AOE lighting or ice rain, you can either stay very close to the boss or extremely far away from the boss. The strongest lizard will cast berserk and increase the trio's damage significantly. It will glows and you will see a sword symbol on top of his head. The main strategy here is to split the party member into 2 groups. Group 1 will focus on the single strongest lizard. Group 2 will have to focus on the intermediate lizard. Whenever the lizard tunnel into the ground, everybody should gather in the pit at the middle of the map to receive miracle hand and holy shield buff from priest. After receiving the buff, don't stay at the middle. Instead move to the edge of the map to the lizard designated to you (mini map helps). The weak lizard can be killed repeatedly since it is weak and can be killed anytime. He can either be in group 1 or 2. Doesn't really matter because he can be killed almost instantly. The two groups should be FAR AWAY from each other so that if any of the 2 lighting/ice lizard cast AOE skills, the other group will not be affected. The reason why the intermediate and the strong one should NOT be too close is because it would be very difficult to balance their HP. * If there are two paladins, both aura should be on: judgement and element aura for extra ice and lightning damage resist. * Keep aggro of the lizard and control the position of the lizard so that they are far enough from the other group. * Interrupt the AOE skill casting is possible. * Each time after the lizard tunnel in, cast miracle hand when they reappear because sometimes they will cast AOE skills immediately after that. * Use high superarmor break skill to interrupt the lizard AOE skills. * Highland when the lizard tunnel in and about to reappear. * Typhoon should NOT be used unless the party is going for the kill. Typhoon will mix up the strong and medium lizard: it will be hard to balance their HP if they are together. * Use disenchanting howl on the strongest lizard when it cast berserk. * Time accelerate the priest so that miracle hand can be cast each round. Once the strongest lizards hp hit at least 1/4 of the last bar, the medium lizard hit at least 1/2 of the last bar bring all of them together. Cast Typhoon, Time acceleration and Miracle hand if available. The 3 lizards have to die within 10sec interval otherwise they will respawn again. 1. Cow stampede: High damage. Very dangerous skill for ranged char. Each hit 5000+, crit 13k. When anyone stepped on the magical circle around Noirback, he will activate this skill. Also, he will cast it at HP x1 and x4. 3. Charged Swing: He wil charged up before he swing his axe. 10k damage. Very large AOE. 4. Stomp: 100% faint unless you have high superamor. 4000+ damage. 5. Wave Chop EX: After slashing with his axe, black crescent wave similar to dark manticore's skill will propagte outwards. Slash damage is 10k, crescent wave damage 8000. 6. Frenzy Explosion: Throw alot of axe. Each hit deal roughly 8000. 7. Dancing Beam: It is activated when his HP bar x 3 is about to be depleted. A yellow beam will affect players around him. After you are hit, you will start dancing. You won't be able to walk or control your char. After that he will summon more cows to attack you while you are dancing. When you enter the stage, you will see alot of bone-like pillars around the place. There will be a big magical circle at Noirbak's feet and he is shielded by an invincible shell. Noirbak is also guarded by alot of smaller minataurs. Avoid stepping on the magical circle around Noirbak to prevent him to casting the cow stampede, which is very lethal to non-tanker char. If ever some1 trigger the cow stampede by accident, cast any dmg reduction/blocking/speed-up skill you might have or try distance yourself from the boss and evade the charging bull. First, move around the area and make sure you keep an eye on the movement of the boss. Avoid stepping on the magical circle around him at all cost. DO NOT cast any relic/stick or apocalypse claw on the field because those stuff will trigger the cow stampede too if the boss happen to move close to it. Agile characters should clear some small bull if possible to facilitate movement of party members. Disabling skills can be used to disable those smaller bull too. Slowly destroy the pillars around the place to deactivate the invincible shell on Noirbak. After destroying all the pillars, Noirbak's invincible shell and the magical circle will disappear. A message will appear on screen when it happens. He will start by using cow stampede until 1/10 of his first hp bar is depleted. This is the most critical stage of the whole battle. Paladin should avatar immediately and try to reduce the HP of the boss enough so that the stampede stop. If there is only one paladin, miracle hand+holy shield from priest and devastating howl+taunting howl+superarmor buff+highland from mercenary need to be casted all together. High HP char should help the paladin to down the HP of the boss till the stampede char. NOTE: Chars like mage and archer will die EVEN in Hand of Miracle. That's how powerful the cow stampede is. Highland is absolutely recommended here. Female char should stay far away from the boss and hide behind the mirror of the force user and priest hand of miracle, until the cow stampede stop. HP x 4 and x3 is very easy. Paladin keep aggro on himself and stay near the edge of the map. Other classes just deal damage to the boss. When HP x3 is about to be depleted, he will start casting the notorious "Dancing Beam". The beam itself deals no damage but the smaller bull around the boss will deal heavy damage to the dancers. Relic of hold, timestop and other means of disabling skills should be used to keep whoever close to the boss and affected by the dancing beam safe. Ranged char should deal damage from far to avoid being hit by the beam. During his last HP bar, he will cast casting Bull charging again, which is extremely dangerous for low HP char without shield block. Force user can use mirror to block the charging stampede.